I'm extremely excited to be able to introduce you to Lara Heacock, a fabulous fellow blogger that I met this summer through a mutual friend. We bonded quickly over cocktails and I've become a huge fan of her blog. As a Life Coach, she helps clients sort through the chaotic noise of life and find their own path. I knew immediately I wanted her to share her wisdom and life philosophy on Austen Hill. Take it away Lara! In 2008, my husband and I ended up in Sedona, AZ for vacation. I say ended up because I wanted to go to Sonoma, but we own a timeshare and there were no properties available in that area when we wanted to travel. So, knowing very little, we took a chance on Sedona. I’d heard it was magical and kind of woo-woo, so I was in! We’ve now been there 5 times and have come to regard it as a second home. Hubs knew I wanted wine tours, and he’s not one to turn down a fermented grape, so he did what he does best – he Googled! Lo and behold, there is a blossoming wine community in the Sedona, AZ area. 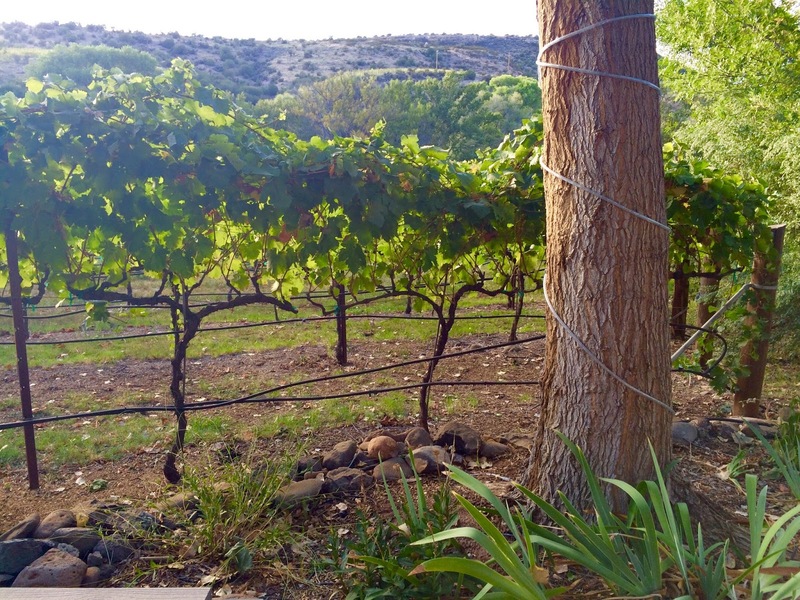 Soon, hubs had created a self-guided Sedona wine tour for us. The wine tour is a staple of our trips to Sedona. Typically we go ourselves, take some snacks and make a day of it, but this past September, we decided to get fancy and take an official tour. Bonus: hubs didn’t have to drive, so he could really enjoy all the wine! 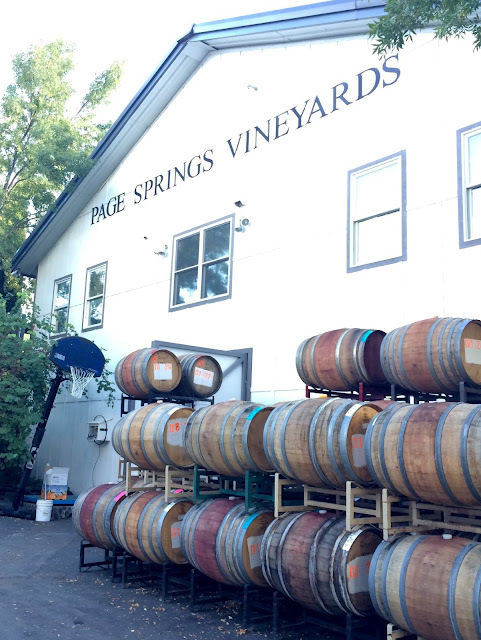 The tour included several wineries, a tour of each and of course, tastings. At each winery, we learned something different and at one winery, we learned something that really stuck with me: stressed grapes make the best wine. Apparently, the more difficult their terroir (the soil and climate that affect the taste of wine), the better they are. Wine makers will often restrict water, crowd vines together and over prune to ensure that all of the vines’ energy is focused on growing the grape. Scientifically, what the vine is doing, is putting all of its energy into reproducing so that it can escape the stress of its existing environment. Interesting. Considering that study after study shows that stress negatively impacts our mood, outlook and health and that stress in humans has been linked to heart disease, blood pressure and even obesity, I think we can safely say that the exact opposite is true for people. Like grape vines, humans also have terroir. Unlike grapes, when our soil is devoid of nutrients and our climate is aggressive, we do not thrive. While grapes become sweeter under stress, humans become bitter. Humans also have choice. We are not grapes and we do not have to stay where we are planted. You can change your terroir. You have choices, you can move freely about the world, and you can create a healthy terroir in which you will flourish. We often forget this in times of stress. The times when the to-do list is a mile long, deadlines are looming and the laundry is out of control. You feel stuck. After all, you can’t just up and quit your job, so you have to muddle through, right? Not quite. Remember, you are not a grape. Even when stress comes from places you can’t control, you can still take steps to improve your terroir. Get curious. This is my favorite place to start. When we’re stuck, we can’t see outside our circumstances. When we engage our curiosity, things start to shift. Maybe a deadline can be moved. Maybe you can delegate some things on the list. Maybe you have a girls’ night in, so you can get the laundry done and still see the ladies. When we get curious, suddenly options appear. Give yourself a time out. We live in a go-go-go world. We multitask; our phones are almost always in our hand and busy has become a status symbol. Take a break. Take a walk…outside…without your phone. Listen to a feel good song. Take a power nap. Go out for lunch with a friend. Taking a time out and changing your environment will shift your mindset. Be grateful. Practicing gratitude is about the last thing we want to do when we’re feeling stressed, yet it’s one of the most powerful ways to change how you’re feeling. When you feel like you’re about to explode, take a deep breath and come up with 3 things for which you are grateful. Are you grateful for the comfortable shoes you’re wearing? Are you having a good hair day? Did you have a delicious cappuccino this morning? The smaller and easier to connect to, the better. The next time you find yourself feeling stuck or overwhelmed, remember the stressed grapes…and that you are not one of them. Get yourself out of grape mentality and try some gratitude; engage your curiosity and a give yourself a time out. Even one little shift can dramatically impact your terroir and get you unstressed fast! 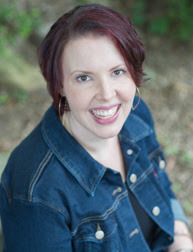 Lara Heacock is a Life Coach specializing in confidence and balance. She helps her clients live a life that feels good on the inside, not just one that looks good on the outside. You can find her online at KindOverMatter.com...because life gets better when you're kind to yourself.